Movie star, television actor, accomplished tie-down roper, premier team roping heeler, multiple world champion – Clay O’Brien Cooper has led a charmed life. 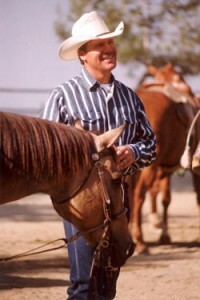 Cooper, born May 6, 1961, in Ray, Ariz., started roping at age 6. He made his first movie debut with John Wayne in The Cowboys and went on to appear in numerous Western movies and television shows. As a heeler, he teamed with Jake Barnes to win a record seven world team roping championships. Cooper and Barnes jointly set the team roping aggregate record at the National Finals Rodeo of 59.1 seconds on 10 head, en route to the world title in 1994. Cooper was the Turquoise Circuit all around champion in 1985-87, 1991 and 1993 and the circuit’s team roping champion in 1983-84. He was the Dodge National Circuit Finals Rodeo team roping winner in 1987, 1989 and 1995. “Since I was a kid, I always wanted to rope for a living. The best thing is being able to make a living for me and my family doing what I always wanted,” Cooper said.